Bilston Glen Colliery at Loanhead near Edinburgh, a well know centre of discord during the Miners' Strike in 1984. The colliery's surface buildings have since been completely demolished. One of the most famous of Scotland's new mines was Bilston Glen Colliery, near Edinburgh. 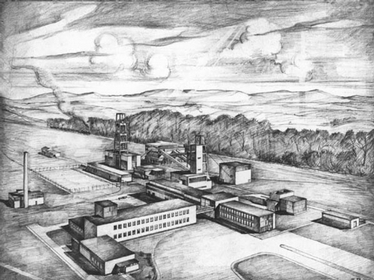 This was another of Egon Riss's designs, but differs from the others because he chose to have the electric winding engines located in separate engine houses on the ground, instead of in large concrete towers. Bilston Glen opened in 1963, and became famous as the focus of discontent in Scotland during the 1984-5 miners' strike. It eventually closed in 1989, and was later demolished. It is now an industrial estate, and no trace of the colliery remains.